An outdoor wooden deck is subject to a great deal of abuse daily. Due to temperature fluctuations and constant exposure to the sun, wind and rain, care and maintenance is necessary to keep the deck surfaces in good condition and extend its lifespan. Pressure treated lumber is by far the most popular decking material used because of its price factor and availability. The majority of PT lumber is made from yellow pine wood which undergoes the ACQ (Alkaline Copper Quaternary) process. The threat of rot and decay from the elements as well as damage done by insects is greatly reduced with the infusion of chemicals into the pine wood. However, due to prolonged surface exposure, moisture and the resulting heat from the sun can cause the wooden decking to split, crack, cup, warp and fade out. When a new deck is built, the wood is normally wet due to the treatment process. In the few weeks or months depending on weather conditions and whether the deck is under a shade, the water will evaporate from the wood. The wood should be allowed to weather gradually and dry completely before any external wood treatment is applied. This way the natural color of the wood will last longer. After the drying process, some minimal warping, shrinkage and cupping should be expected, which is a normal characteristic of treated lumber. Before proceeding to paint, stain or use any clear water repellent, it is always recommended that you read and follow the manufacturer’s guidelines as well as the label of the finishing product. Test the product on smaller sections to make sure the results are what you expect before going ahead to complete the whole area. SHOULD YOU USE A STAIN OR SEALER? 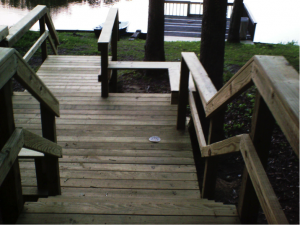 Ideally, decks should be applied with sealers for protection against the effects of water and sun. The type of stain you choose will depend on how you want the deck to look. A clear stain shows off the pine wood’s natural grain and up to 2 years of waterproof protection. Colored and semi-transparent stains vary in the degree of tint and durability while solid stains with extra color pigment can last up to 5 years. Using a combination of stain and sealer is probably the best solution because this means that it is a single coat and single step application. However certain stains that you like might not have a sealer so they have to be purchased separately. The dreaded mold, mildew and algae grow on the surface of most products. Whether the wood is treated or untreated, excessive moisture conditions promote its growth. Usually, mild soap and water can be used to remove surface mold. There is a number of deck cleaning products available that contains chlorine but it has to be compatible with the decking material to avoid any damages. Whether you use a power spray or plenty of elbow grease, make sure that you adhere to the manufacturer’s instructions before you begin the cleaning process to get optimum results.